The Korean Lunar New Year is a celebration of a new beginning: a chance to right wrongs and to change the bad luck of the previous year. During the Joseon period, this was often done through competition and traditional combat. Boys and young men were the chief combatants and fought not only in the large open fields near cities and villages but in the sky as well. The combatants often coated their kite strings with powdered glass making it easier to cut the strings of their opponents’. But kite fighting was not the greatest Lunar New Year competition. That honor belongs to the “seokjeon” or stone battle. These battles often took place between two villages or guilds with one side usually claiming that it had been wronged by the other. They were staged in large open fields and involved hundreds of participants armed with rounded polished stones, iron and wooden cudgels, armor made from twisted straw, wooden shields, and leather caps. Crowds of spectators, including women and children, watched from the safety of surrounding hills and city walls, much like modern stadiums. They ate and drank and encouraged their favorite team while jeering the opponents. Naturally enough, betting was also a part of the event. From opposite sides of the field the combatants advanced upon one another hurtling stones as well as insults. When they were close enough to one another, the cudgels and shields were employed. These pitched battles went on for hours, if not days, and surged from one side of the field to the other. The game ended when one side was completely routed from the field. The victors were treated as heroes while the losers were scorned and cursed. The injuries were horrendous. Shattered teeth, broken bones were quite common, especially about the face and arms. Casualties were an accepted part of the game too. Children held their own stone battles. 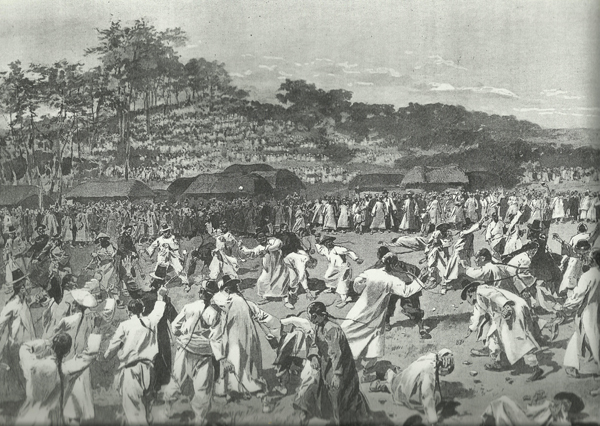 One Westerner observed a children’s battle in 1890 in what is now downtown Seoul. Mothers brought their young sons, some as young as eight years old, to the battlefield where they were divided into two teams. Then, much like the battles of their older peers, the young boys hurled stones and beat one another with their clubs while their parents cheered and urged them on. Undoubtedly, these battles were much shorter than their adult counterparts, but they were just as brutal with comparable injuries. Seokjeon does not appear to have been popular on Jeju Island, which had its own type of stone battles called “deumdol-deulgi” or stone lifting. Professor David Nemeth suggests that jealousy may have been the origin of deumdol-deulgi. According to him, a couple centuries ago, Taerim, a village on the northwestern side of Jeju Island, experienced a rash of bad luck. A geomancer was consulted and he informed the village elders that the land was cursed because it was unbalanced. He advised that the balance could be restored if they placed two huge stones, one upon the other, near the village’s border. The stones were rolled to the site but no one in the village could devise a method to lift one onto the other. They were just too heavy. The village seemed doomed until, reminiscent of the tale of King Arthur, an unlikely hero appeared. A young villager named Pak single-handedly lifted one of the stones and placed it upon the other, thus saving the village. Immediately, the village began to prosper and in honor of the miracle that had taken place, the village came to be known as “Ipseok” or standing-stone village. But every action has a reaction and the geomantic balancing of Ipseok (which later became known as Taerim) caused an imbalance in the nearby village of Suwon. Over the years Taerim began to prosper and was blessed with the birth of many strong sons while the once prosperous village of Suwon began to decline. Naturally enough, the residents of Suwon felt that their bad luck was due to Taerim and so, in the middle of the night, a group of Suwon men went to the site of Taerim’s stones and knocked them down. Taerim, which now had a large number of strong young men, was able to restore the stones to their original position. As soon as they did so, the men from Suwon would knock them over again. Reportedly, this stone feud went on for decades. Stone lifting then became a rite of passage for young men, a way to gauge their virility. Stones were placed at the village’s entrance and the men would amuse themselves and impress their peers and the women of the village by moving the stones. On the rare occasions they would even lift them. Unsurprisingly, village stones were occasionally stolen by a rivals who would then prominently display them in their own village in a show of dominance. Unlike seokjeon on the mainland, Jeju’s deumdol-deulgi is still celebrated during the Lunar New Year. However, it has lost its original spirit and seems more for the tourists than an actual competition of male strength and virility. The two original stones that began the tradition have been lost, destroyed by modernization and progress. The author wishes to express his appreciation to Prof. David Nemeth for his input on deumdol-deulgi in the writing of this report.